While driving around with B several nights ago, my darling mentioned his next dream car to me. We're currently using a Toyota Vios and B would love to upgrade to a Camry next. Apparently it's huge and I love the sound of that. The bigger the better and I do prefer comfort and space especially when travelling long distance in our car. Our Vios is great and is still in excellent condition. B bought it brand new. We prefer to buy things that are new as opposed to second hand simply because we feel it will last longer if it's new. Plus the possibility of us experiencing a breakdown with something second hand is greater compared to a brand new car. B has been driving his Vios for about three years now and he diligently services it every few months. And so far, we've not had any major problems with the car; everything seems to be running smooth. I wonder what B thinks of the new Toyota Prius; not sure if he's seen it yet. 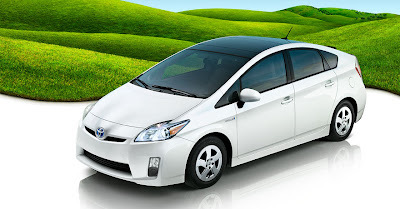 Apparently the most fuel-efficient hybrid car in town, the 3rd generation 2010 Toyota Prius allows you to drive from four different modes namely Stealth Mode, Economy Mode, Power Mode and Normal Mode. With aerodynamic styling and a solar roof, the new sleek Toyota Prius is designed for maximum driving pleasure, comfort and peace of mind security. Truly, this hybrid is too cool for words! I'm not a huge car enthusiast but I know a good car when I see one so I'll be sure to bring it up the next time B starts talking about cars again. Until then, enjoy your Thursday and hey, the weekend is almost here! MCS so soon after they said it’s fixed??? GALM! Meow 1, speedy as always Mon! Some more not sleepy yet, sure la get to be Meow 1 here ha ha! i dont think so it’s fixed coz i refreshed many times edi some comments had disappeared! no CL at MD Mariuca? aha.. ingatkan sempat rupanya zeffer dah chop dulu. woottt.. new car for you dearie?? eh BV ke ni? Wah.. you guys get great offers from RM. Hmm.. write to them perhaps? Glitch somewhere? Marzie, you should def upgrade! I like! Very sleek indeed! that Prius looks fabulous but it is very pricey. hope you have a wonderful weekend dear. I still have problems with comments not showing at Mariuca .. Thank you LR, have a good one too!